I his long-legged, long-tailed bird, with its compact build, is adapted for ground-dwelling in forest conditions. It lives in warm, moist forest, secondary forest (areas where the trees have regrown after forest clearance), and scrub, in lowlands and hills. Within these habitats it prefers areas of thick vegetation, running fast to escape when danger threatens. 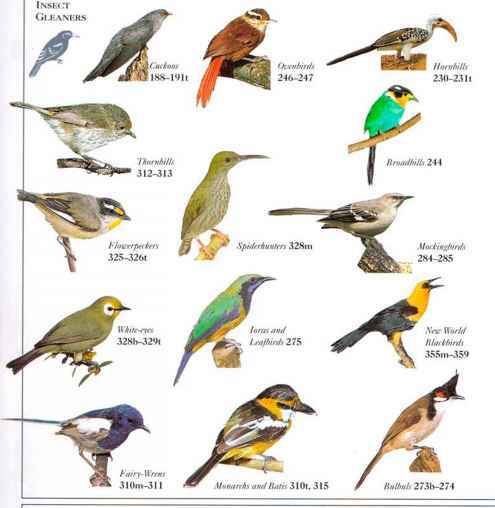 An evasive bird, it is difficult to observe, and is thinly distributed across its range. It eats a wide range of small creatures. Calls arc used to maintain contact between individuals; pairs are heard "dilating with a harsh, deep, whistling note. • nest Not a nest parasite; a cup nest of twigs and leaves is made, in a tree or occasionally on the ground. • Distribution From distkiiii ition N.W. Thailand to s. Vietnam. Slenderly built, with a long, broad tail and strong legs, this ground-dwelling cuckoo is a bird of undergrowth. It walks and runs rapidly, pushing its way through grass and herbage, and also jumping and clambering among low branches. Although capable of flight, it prefers to hide in dense vegetation. The wings arc short and rounded, and flight is low, labored, and clumsy. 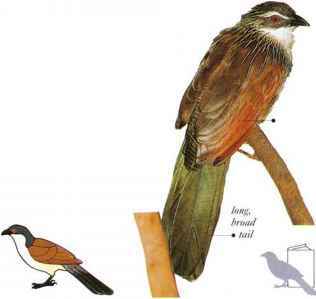 The White-browed Coucal lives in grassy areas with bushes, overgrown marshland vegetation, and undergrowth, usually near water. It eats a wide range of insects and small animals. The call is a distinctive bubbling sound, rising and falling in pitch. • NKST A large, untidy dome with a side entrance, made of grass, placed low above ground or water, in reeds or in a bush. • DlSTKIBl ITION From the Nile Valley in Sudan south through E. Africa, Angola, and Zimbabwe to South Africa. • REMARK Southern subspecies lacks the white "eyebrow" arul back markings.